This tutorial will provide a quick introduction to compiling a very simple ActionScript application using SharpStyle Neutron. 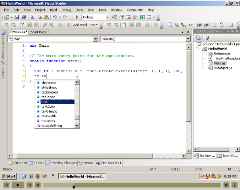 SharpStyle Neutron is a plug-in for ActionScript 2.0 development in Microsoft Visual Studio 2005. This product is a must-have for developers working alone or in teams on building next generation Rich Internet Applications that combine Flash on the front-end and .NET on the server-side.